This program implements a classic individual choice problem that has been studied by psychologists for at over 70 years. The subject must guess which of two random events will occur. The probability of the more likely event is specified by the experimenter but unknown to the subject, who learns through repeated trials. The program also allows specification of a monetary rewards for correct guesses, and there is hypothetical ("do your best") treatment option. "Probability matching" describes a tendency for subjects to choose the more likely event with a probability that matches the event probability, which is clearly irrational. 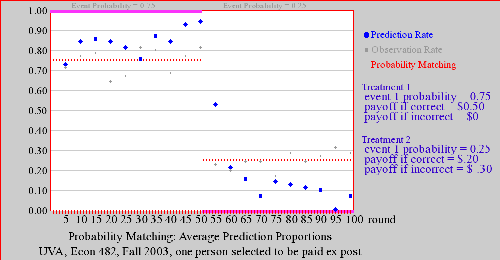 Some economists and psychologists have found that probability matching behavior is rare when financial incentives are used. For a discussion of the seminal work of Siegel in the late fifties, see Chapter 27 of Holt (2006) Markets, Games, and Strategic Behavior.